How does sustaining the diversity of cultures relate to the general task of sustainability? Posted in: Communities in Global Environment, Community Quests, Uncategorized. I’m over the hump, 7 out of 12 chemo’s under my belt, and so far I’m still tolerating them pretty well. I asked my oncologist about this and she said that the weekly treatments, with smaller doses, are easier on the patient, and also very deadly to the cancer as they catch many rounds of cell generation. I get fatigued and have had some diarrhea a few days after treatment, but all things considered, I’m doing okay. I’m glad that my body is fighting strong and putting up with all this and I’m hoping it keeps up! Felinoterapia gracias a Koshka. The cat making sure I get my rest. The border into Rwanda has its share of bureaucratic mysteries. Which line do you stand in first? What happens to your passport when it is passed to unseen sets of hands further along the counter? Who will hand over the change for the dollars you paid for the visa? Why don’t they tell you where to go next? The officials were civil but offered few clues and no human connection. We made it through with minimal delay and were on our way toward Musanze. We were prepared to notice the lack of litter compared to Uganda–plastic bags are even against the law! The roadsides felt more manicured and were lined with young trees. The thatched roofs of Uganda gave way to peaked metal roofs of French colonial Rwanda. In the background, we glimpsed looming volcanoes rising up from the vast highland jungle spanning the boundaries of Uganda, Rwanda, and the Congo. Vehicular traffic is sparse, but the flow of walking people and bicycles is steady. They carry the cargo of rural life, bundles of sticks and straw, water jugs, baskets of fruit. Nothing to reconcile the news reels of chaos and massacre that had defiined my image of the country. Our tour with Emmanuel from the Gorilla Organization takes us behind the tidy borders of the main thoroughfares and into the worlds occupied by the people we see walking the roads. His organization grew out of Dianne Fossey’s work to save the mountain gorillas when the research-centered American organization split from the European organization that was more interested community centered approaches to habitat preservation. The latter kept the name The Gorilla Organization and had been Emmanuel’s employer for twelve years. We took a small tour around the neighborhood while waiting for his staff to arrive at the field office. The narrow streets were hemmed in by stucco walls. People looked on curiously–this is not a tourist destination. 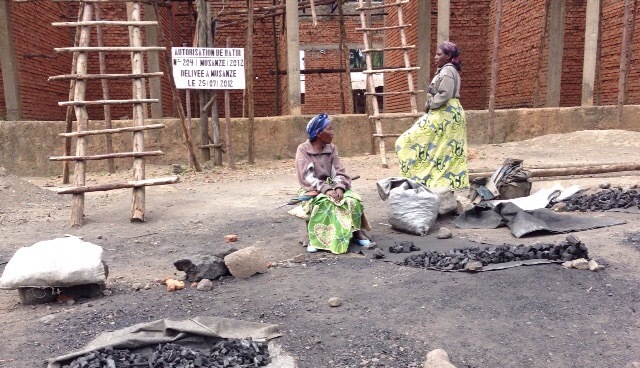 On the other side of the block, we came into an open marketplace, sellers of beans and charcoal are on one side. In the middle of the plaza was a crowd of people and goats. It was hard to discern the process of buying and selling. On the next street, tailors and cobblers have more permanent stations along the street. When we got back to Emmanuel’s field office his staff had arrived and we toured the small office. He introduced his staff and explained that they are of the Batwa people who were removed from the national parks to protect he natural habit for the mountain gorillas. In an effort to downplay ethnic identity after the 1994 genocide, the government refers to the Batwa simply as historically marginalized people. The Gorilla Organization is working to help the Batwa to adapt from a hunter-gatherer livelihoods to agriculture. 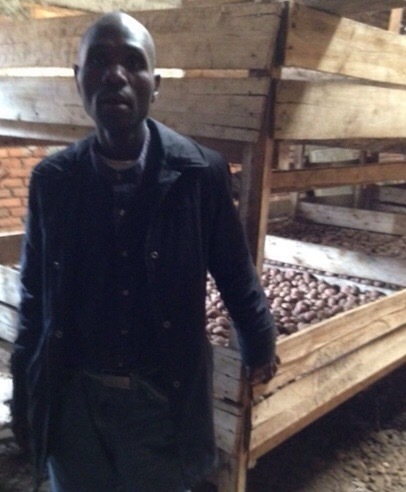 The Batwa staffmembers showed us the storeroom where their communities store seed potato for the next year’s planting. 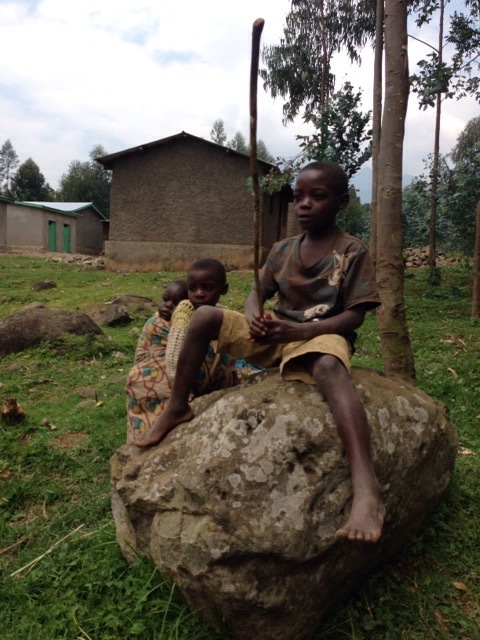 We traveled into the forest to visited one of the relocated communities, conditions were very basic and, according to Emmanuel, both parents are often at home and without work. 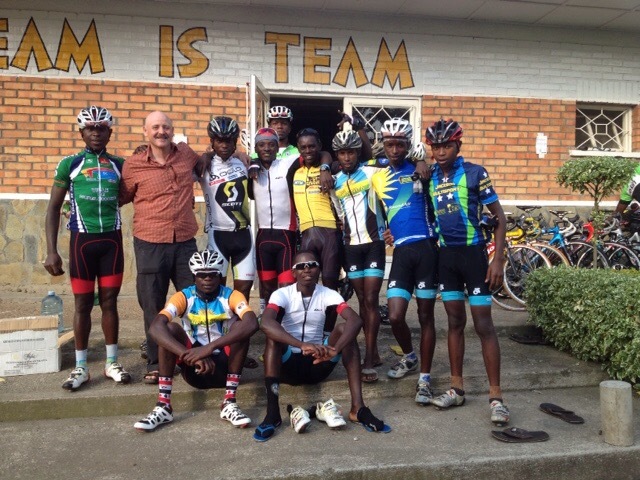 Our day began at the Africa Rising training camp with the cyclists of Team Rwanda. The riders were up early to have breakfast before their morning training and I sat with them while they ate large bowls of porridge with a hard boiled egg mixed in. Nathan and Gasore are two of the original riders who appeared in the Rising from Ashes film. They are in their early thirties, ten years older than most of the riders. These veterans play key coaching and leadership roles, and, with strong English and international experience, they interact with us most readily. These men were ten year old kids when their homeland was ripped to shreds by genocide. The riders welcomed us to their morning table without hesitation, perhaps realizing that every visiting Mzungu may be a potential sponsor, or maybe just because they are used to sharing what they have. The cycling project was conceived by Americans and works directly with the Rwandan federation for cycling, an organization that would have little significance without Team Rwanda. There is not a Rwandan Board of directors but the bodies, hearts and minds that push the bikes ever faster, working as a team, are pure Rwanda.